Osage City officially opened its Christmas season with a Saturday full of events. 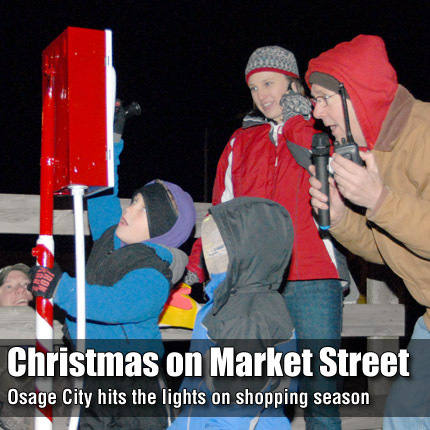 At the beginning of Osage City’s nighttime parade, Cooper and Kasen Parsons, ages 4 and 3, were given the honor of lighting the downtown Christmas lights; Christmas on Market organizer Katie Buenger and announcer Willie Atchison assisted. Santa Claus’ trip down Market Street in a horse-drawn wagon delighted the children. Hosts of the celebration, The Osage City Chamber of Commerce, announced winners of some of the day’s events: Window decorating contest – Landmark National Bank, first place, Schroeder Drug, second place, Radio Shack, third place; float contest – Osage Nursing Center, first, Willing Workers 4-H, second, Boy Scouts and Girl Scouts of Osage City, third; chili cook-off – Mary Jordan, first, Barb Thompson, second, Chuck Walquist, third.